Microchip's LAN89730 was specifically designed to provide a high-performance, low-cost USB to 10/100 Ethernet connectivity solution with a Hi-Speed Inter-Chip (HSIC) interface for automotive applications. Many high-performance mobile processor include an HSIC interface to reduce pin count and power, and often do not include an Ethernet interface. The LAN89730 provides a convenient way to connect such processors to an Ethernet network. Taking advantage of the broad availability of existing USB drivers and software, Microchip's proprietary HSIC technology incorporates a 2-pin digital bus that enables the use of USB as a low-power, chip-to-chip interconnect at speeds up to 480 Mbps. The internal device controller is USB 2.0-compliant and the HSIC interface is HSIC USB Electrical Specification Revision 1.0-compliant. The device implements Control, Interrupt and Bulk-in and Bulk-out USB endpoints. Microchip's UniClock™ technology simplifies the clocking scheme and reduces system BOM costs by using a single 25MHz crystal for both USB and Ethernet connectivity – without the need for additional components when adding USB hubs. 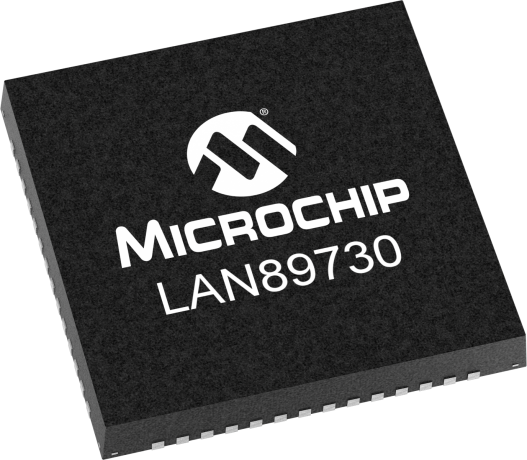 Applications well-suited for the LAN89730 include remote antenna modules and providing Ethernet connections to micro controllers that lack an Ethernet interface. The LAN89730 supports auto-negotiation, auto-polarity correction, HP Auto-MDIX† and is compliant with IEEE802.3 and 802.3u standards. An external MII provides support for an external PHY which enables connection to several physical layers. Multiple power management features are provided, including various low power modes, as well as Magic Packet, Wake-on-LAN and Link Status Change wake events. These events can be programmed to initiate a remote USB wakeup. A PCI-like PME wake is also supported when the USB host controller is disabled. Additionally, Microchip offers its complimentary and confidential LANCheck® online design review services to customers who select our products for their application design-in. Automotive AEC-Q100 qualified, Grade 3 (-40° to 85°C) temperature ranges.